This is the third installment of the Lost Lake Stories cycle. This mixup was inspired by the movie Paris, Texas featuring an awesome soundtrack score by Ry Cooder. The movie opens with a man walking alone in the desert with nothing but the wind and sun for company. I took this image and decided to create my own soundtrack of a solitary lonesome man traveling in an empty quiet western landscape through deserts and small backwater towns…towns that whisper instead of shout. Keeping with the literary theme of the previous two mixes, the title comes from a book by Jack Kerouac, Lonesome Traveler, about his hobo-like wanderings through 1950’s America and Mexico. The mix has a decidedly twangy western feel to compliment Ry Cooder’s amazing slide guitar while keeping a slow, quiet ambient progression. The jpeg “score” for this mix is included in the Cover Art and Score Zip file below. Also, right below is the “soundword” description for the mix I did again trying to use a Kerouac-like automatic writing style. I hope you enjoy this new mixup. And remember, I like comments! Lonesome Traveler walks through ghosttown dreams and desert sandsky searching for slow memories of a brightskip life. Sunheat washes over lazy landscapes shimmering slitscan in still life. Warm wind blows guitarsong for lonely days of heathaze lands and moonsurf nights. Timetrip towns in oldtime, lost among backwater roads and black and white Kodaks. Shining stargazes of forevernever hope. Lone footfalls on sand and sidewalk spying distant boys on bikes and sundress breezeflutters against softblue sunwashed skies. A storyneverending journeysearch for sunmelted ice cream cones and porchcold lemonade laughter mixed with quiet smiles and warm words from melted hearts and clouddrift minds. He walks between seconds of memorytime. A boxgathering rises in the farscape edge of the sky. Yearning feet turn on the brightmelted blackribbonhighway. Alonetown echos emptynothing sounds as Traveler passes through on silent strings of memories. Alone. Loren Connors Voice of the Ocean, Despair Not! Not that anyone cares or will notice but I changed my blog title. I took the accent off the "e" in cafe. It seems it was screwing up search engines and making trouble for feeds. It's been a busy last couple of months but I am finally getting back to the Café! 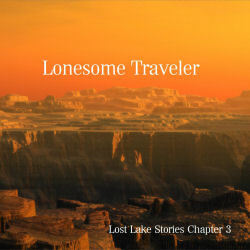 I'll be posting a new mix shortly...Chapter 3 of the Lost Lake Stories cycle...Lonesome Traveler. My friend Dave over at Low Light Mixes has recently posted two excellent mixes, "Autumn MIx" and "String Theory". Go check them out, they're great!